Why should cakes hog all the red velvet goodness? I’ve eaten a million red velvet cakes and, until recently, I’d never had a red velvet cookie. The version I had was a peanut butter blossom with a red velvet component (which means there’s some cocoa and red food coloring in it). Something about the peanut butter part didn’t taste right to me (I mean, peanut butter doesn’t go with red, right?) so I changed it up and used Biscoff instead. 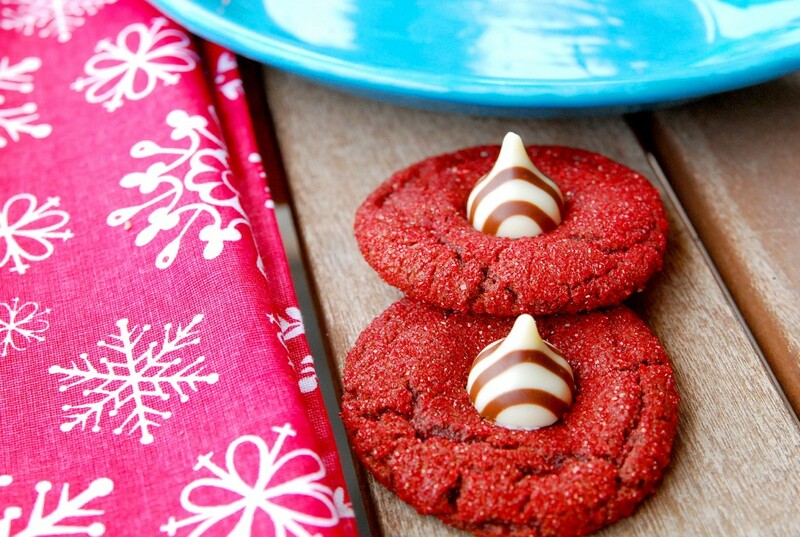 Because a red holiday cookie should be spiced, don’t you think? The Biscoff spread gives it a speculoos cookie flavor (kind of like a spiced gingerbread) and I kept the cocoa and red coloring to stay true to the red velvet. And because red velvet stuff often bakes up a little darker red than you’d like, I coated these in beautiful red sanding sugar. 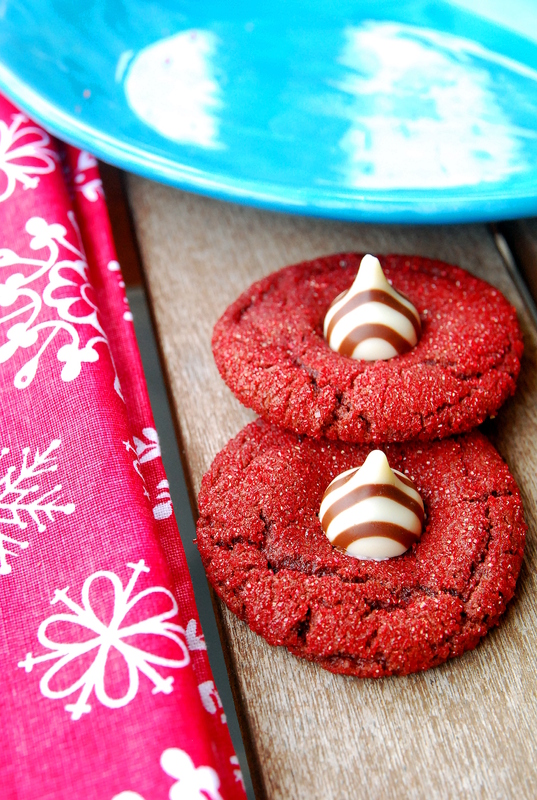 They might be the prettiest cookie on your cookie platter this year! p.s. Make sure scoop level tablespoons of this dough. If the cookies are too big, they don’t look as cute with the Hershey’s Hug in the center. Hershey’s Hugs are the black and white striped ones. Beat butter, Biscoff, and sugar in stand mixer for about 2 minutes on medium speed. Turn mixer to low and add in egg, milk, vanilla, and red food coloring. Mix for about 30 seconds to incorporate, then turn mixer to medium high and blend until light and fluffy. In a separate bowl sift cocoa, flour, baking soda and salt. With mixer on slow add flour mixture to sugar mixture and beat until just combined. Chill dough for at least two hours (up to overnight). Heat oven to 375. Line cookie sheets with silpat liners or parchment. Shape dough into tablespoon-sized balls. Pour red sanding sugar onto small plate or bowl. Roll dough ball in sanding sugar and place on prepared cookie sheet about 2 inches apart. Bake for 8 to 10 minutes or until edges start to crackle and centers don't appear wet. Once cookies are done baking, remove from oven and immediately press a Hershey Kiss into the center of each cookie. The cookie should crack around edges. Allow cookies to cool to room temperature.